The South African president, Jacob Zuma, has appointed the country’s first openly gay cabinet minister, thought also to be a first in Africa and a symbolic step on a continent enduring a homophobic backlash. 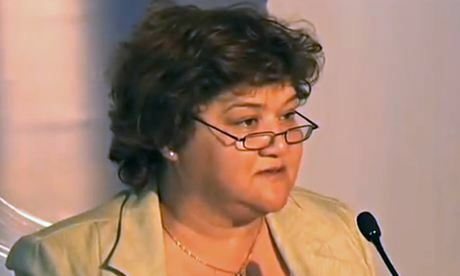 Lynne Brown becomes the public enterprises minister in a cabinet that also includes South Africa‘s first black minister of finance. Brown, 52, who is coloured (of mixed race ancestry), was born in Cape Town and was premier of Western Cape until the African National Congress (ANC) lost control of the province to the opposition Democratic Alliance in 2009. Her personal interests were said to be playing golf, reading and “an admiration of arts and culture”. She is not seen as a gay rights activist but her ascent to a cabinet post was described on Monday as a significant moment. Eusebius McKaiser, a broadcaster and political author, who is gay, said: “It is, sadly, probably newsworthy, I guess, insofar as the social impact of openly gay people in high-profile public leadership positions cannot be discounted in a country like South Africa where levels of homophobia, including violence against black lesbian women, remain rife. South Africa was the first African country to legalise gay marriage but Zuma, a traditional Zulu polygamist, has previously been criticised for culturally fundamentalist remarks and failing to condemn anti-gay crackdowns in Nigeria and Uganda. Meanwhile Zuma, 72, who was inaugurated on Saturday for a second term, named Nhlanhla Nene as finance minister, the first black person to hold the position. Nene, 55, had served as deputy to the widely respected Pravin Gordhan, who is of Indian ancestry. Nene, whose first name means “luck” in Zulu, is a former parliamentarian and chair of the finance portfolio committee. He spent 15 years at the insurance firm MetLife, where he was a regional administrative manager and where, during racial apartheid, he organised the country’s first strike in the financial sector. After a punishing five-month strike in the platinum mines, the mineral resources minister, Susan Shabangu, was removed. The police minister, Nathi Mthethwa, who was in office during the killing of 34 striking miners at Marikana in 2012, was also shifted from his post.